(Peter): We are Peter and Katharina de Graaf, married since 2009. In 2013 our wonderful son Joël was born and in 2016 our daughter Cora. Let me introduce Katharina to you. Katharina is a woman with many talents. 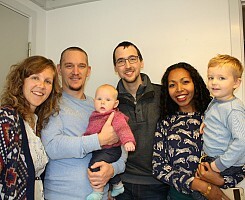 Besides the intensity of raising Joël and Cora she is very involved with the Greenlanders and has a strong desire to see them grow up in their relationship with Jesus. 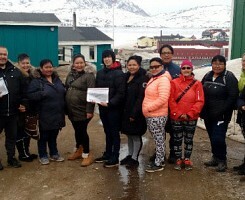 She would like to work in the area of counseling but at the moment that is only possible very limited due to the difficult Greenlandic language. Katharina would tell you that she is not very talented in learning languages, but I disagree with her. I am afraid I will not be able to keep up with her in learning Greenlandic. Not only does she enjoy (spiritual) parenting, she also likes to be busy in a practical way. I am thinking of learning to bake bread, learning how to prepare whale meat or decorating the living room to make it feel cozy. If you would ask her what her passion is she would say it was knowing God. She is a real live enjoyer with passion for God and people. (Katharina): Peter is a passionate man. If he is enthusiast about something he goes all the way for it. 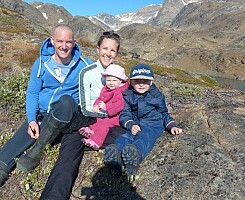 In 2006 he was in Greenland, Tasiilaq, for one month during his discipleship training with Youth With A Mission. During that time he saw Gods power at work in a way that put his whole live upside down. This contributed to the desire to one day come back to further invest in the people in Tasiilaq. Peter loves it when people come in touch with the power of God and experience in their own live that God lives, loves them and intervenes in their personal need. Live in Greenland fits Peter well. He likes fishing and for the hunt it comes in handy that he has learned how to shoot during his education to become an officer. Spiritually Peter gets his turn here in Tasiilaq as well. He has much insight in the spiritual situation of people, is good at teaching and sensitive to the Holy Spirit. What I like about Peter is that he is always eagerly searching to understand Gods voice better. Besides the spiritual work Peter diligently takes up the other tasks that come his way. He is also very determined to learn the Greenlandic language. Following the motto ‘don’t take yourself too serious’ he makes jokes if things don’t work out as expected and he can make Joël laugh as no one else. Peter likes reading books that inspire him to live closer to God; he enjoys good coffee, meat, licorice and a game of darts. (Peter): at last I want to introduce our son Joël and daughter Cora. He was born on July the 25th and comes alive when he starts knowing people. He is relatively quick to trust and I really like his open look towards strangers. But he is also carefully observing whom he is dealing with and will react is there is something ominous in a person. He is a sensitive little boy with a good heart who also loves giving away to others. I am looking forward to seeing him pick up the language that is spoken around him. And sometimes he can of course get really upset if he got into his head how to do something and it does not work out that way. He is a real discoverer who can quickly grasp things. Cora is still so little and is born in Tasiilaq on the 31st of May, 2016. She gets all our attention and is growing fast! A beautiful little girl to see and we are very curious how she will be while growing up.